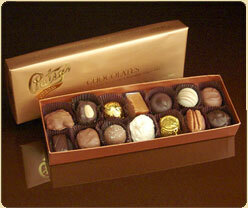 Patsy’s gourmet chocolates are divinely smooth and creamy. Substance and pleasure in the discovery of tastes that await you in this box of fabulous chocolate assortments. In milk chocolate and dark chocolate. Fine handmade chocolates in old world European style.